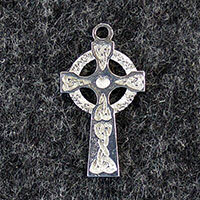 Medium Pewter High Cross (Cross with a halo (nimbus)) with a Celtic knot work motif design style A. Detail on both sides. Also avaliable in acrylic and wood as well as in a larger size pendent in acrylic, pewter and wood as well.